Back in the 80’s who would have ever thought that musicians with egos as big as Sting and Paul Simon would share a stage? Back in the 80’s who ever thought the music of Sting and Paul Simon could ever blend so well? Sting and his Police band mates were ska and punk and then pop and Paul Simon, well, he is the master of folk and later global and world music. But there they were, halfway through their tour at Detroit’s Palace at Auburn Hills, making beautiful music together for 2 hours and 40 minutes and most of the audience – some of us who were moved DOWN a section closer to the magic because the show didn’t sell out (Detroit, you missed a good show if you didn’t get a ticket) – we couldn’t get enough. Both artists admitted that this was the perfect juncture in their tour, where their bands were really starting to come together as they learned each other’s styles. 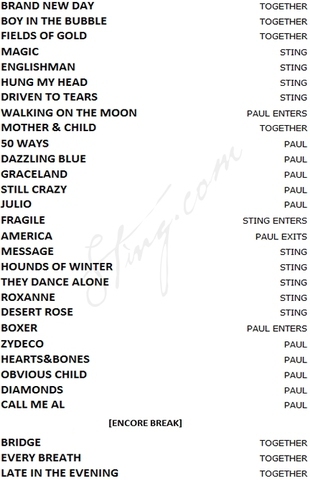 It was a bit of an adjustment for me to hear Sting sing some lines from Boy in the Bubble or Simon to add his voice to Fields of Gold, but it added a different dimension to each song and worked in the end. At one point, Sing took the stage alone and told the audience that songs have a way of taking us back to the times in our lives when we first heard them. He recalled traveling across the United States in a station wagon with the Police during their first tour before singing Simon & Garfunkel‘s America. I know that each song carried a memory for everyone who was there that frigid night. I’d love to hear about what memories these songs bring to you. Here are some of mine. Of all the songs that WEREN’T played, I really wanted to hear Cecilia. Like, dying to hear it. Wished the concert would have closed to it. My earliest musical memories were nursed on Bridge Over Troubled Water. My parents playing the album constantly and my Dad belting the song for which the album was named at the top of his lungs in the shower. He could give Art Garfunkel a run for his money. But just in the shower. I think I was three or four, kneeling by my parent’s ancient stereo speakers as it played (and that’s on a turn table, you young whipper snappers!). As the last bars of El Condor Pasa finished, I knew it was coming. I’d start jumping before the music even started. I couldn’t wait. And then the unmistakably joyful drumming of Cecila would play and I’d dance all over the living room. Sang the words at the top of my lungs. I guess my parents thought it was good thing I had no idea what I was singing. Really, they are nasty lyrics. Later, much later, I can recall a perfect summer night in 1991 when Paul Simon played a free concert in Central Park. The music from Rhythm of the Saints mixed perfectly with the humid air. You know who you were who were there. I don’t know how we all successfully met up to enjoy the concert – about a mile away from the stage – in the days before our cell phones. The Police and Sting dominated the air waves during high school. We all sang Every Breath you Take, thinking it was a song about love but later realized it was a song about obsession. High school was the time we began to figure out for ourselves the difference between the two. The music of the Police affirmed to me that, no dad, musicians were not all stupid junkies. Yes, musicians are intelligent people. Sting was an English teacher after all. Classmates had conversation in the hall about Don’t Stand So Close to Me, after we learned the song was written about an inappropriate interest Sting took to one of his students. Later, the album Nothing Like the Sun defined my college years. The scorching summer of 1988 and a fall weekend road trip to Boston. But getting back to the present…. Perhaps even more impressive than Sting and Simon collaborating on each other’s songs was the collaboration and depth of their bands. Members of each band effortlessly switched from instrument to instrument. From drums to guitar. From guitar to electric violin. From cello to piccolo. From the accordion sounds of Zydeco to the bass riff in Call Me Al. Since my son has been obsessively playing his guitar, I have developed a greater appreciation for these musicians, who should not by any means be considered “backup” musicians. This is why, even though he hates it, I won’t let him quit his clarinet. Lots of musicians play guitar, but how many play guitar and clarinet? Sing and Simon closed the night with “When Will I Be Loved” It was a night I didn’t want to end and I’m still thinking about Sting in that perfectly fitted shirt and oh, it’s just not fair for a man to look that good at – 62! What is the point of this long-winded blog post written on yet another frigid Michigan day? Don’t miss out on a great show. Get tickets to this concert when it comes your way.